Cool back in the day, popcorn ceilings, sometimes to referred to as a cottage cheese ceiling or even acoustic ceiling, were designed to help hide any imperfections in the ceiling with its well-known bumpy texture. As time went on, though, as with any fashion trend, popcorn ceilings are now looked at as an eyesore, often making a room look quite outdated. Since many homeowners want to remove this ceiling, either when moving into a new home or during a remodel, it will, of course, come at a price. The cost to remove a popcorn ceiling will depend on a few factors, including the contractor you hire, the type of popcorn ceiling and your geographical location. On average, a straightforward popcorn ceiling removal, without any obstacles or asbestos removal, can cost $1.50 to $3 per square foot, but these costs can increase if asbestos was found inside the ceiling. If asbestos needs to be removed, along with the ceiling, then be prepared to spend $5 to $7 per square foot and plan on spending more to either re-paint the ceiling or add another type of ceiling option to create a finished look. If you want an exact quote for your job, we highly recommend using the free tool offered by HomeAdvisor.com to receive multiple free quotes from licensed and screened contractors in your area. With this tool, all you need to do is explain your job and with this information, contractors will contact you with a no-obligation quote, allowing you to compare the quotes to make an informed decision. It’s fast, free and no credit card is required. Disposal – Some contractors may charge a disposal fee, especially in the case of asbestos as this will take more work to ensure no debris is left behind. To budget, disposal can cost another $100 to $400. Furniture – If any furniture is in the way of the ceiling and has to be removed, especially heavier items, then be prepared to spend about $50 to $100 per room. Asbestos Testing – As mentioned, a test is almost always be required and will be considered an additional expense. Asbestos testing for popcorn ceilings, depending on the contractor you use and the size of the ceiling, can cost $400 to $800 on average. 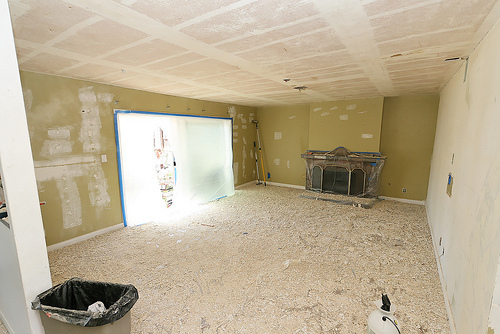 Renovation – After the popcorn ceiling is removed, the estimates above will not include the paint or the new ceiling treatment — only the finished, sanded down ceiling. Higher than average ceilings – Rooms with higher ceilings may increase the costs by 20 to 30 percent on average. In most cases, before a contractor even removes the popcorn ceiling, they may want to first test to ensure no asbestos is present. As mentioned, it if is there, this will involve much more work to ensure the asbestos is gone for good. During the process, the popcorn texture is scraped away from the ceiling using this type of scraper., but before doing so, the ceiling will be slightly misty to avoid creating a dusty environment. At this time, the entire room will be covered with a drop cloth and the walls will be taped with plastic to collect all of the debris and the dust to make sure it’s disposed of properly. Next, after the popcorn ceiling is scraped in its entirety, the contractor will then apply a layer of drywall mud over the ceiling and will sand it flat once dry. After creating a smooth surface, the ceiling is then either painted or a ceiling type of your choice is installed. In the past, asbestos was used in construction due to its fire-resistant properties; however, as time went on, countless studies noted the health concerns in relations to it such as mesothelioma cancer. Even if you do not plan on removing your popcorn ceilings today, you may want to consider getting them tested, at a minimum, to confirm no asbestos is present. Tests, depending on who you use, can cost anywhere from $400 to $800 on average, with a follow-up, in the case of a positive result, being another $200 to $300 to confirm the asbestos disappeared. In 1978, the “Clean Air Act” banned the use of asbestos in all building-related products, but manufacturers were allowed to get rid of their inventory after this, meaning some products were sold well into the early 1980s.